Powers/Abilities: Little is known about their physical abilities. They were sufficiently scientifically advanced to bioengineer life and to create interstellar craft. Traits: The Terminex thirsted for cosmic conquest and were spiteful and vindictive, to the point of genecide. They were described by both others and themselves as evil. (Thor Annual#15 (fb)) - The Terminex existed at some point in the distant past. Their dreams of cosmic conquest attracted the attention of the infinitely more powerful Celestials who sought to destroy them to save the universe from them. Realizing that they would not be able to stop the Celestials, the Terminex instead plotted revenge. They began to develop a form of life designed to bring the end of the Celestials' dream of a structured, peaceful universe. At the same time, they designed a ship that would be able to escape their planet as the Celestials attacked, so that their vehicle of vengeance would survive them. As the Celestials attacked, the leaders of the Terminex at last succeeded in creating a culture of microbes, the Termini. In the instants before the last bastion of their civilization was buried beneath mega-tons of rock and rubble, the Terminex sent their precious burden skyward. Focusing on their attack, the Celestials failed to notice the ships escape, and they began their grim task of sowing the planet's soil and atmosphere with deadly poisons, so that nothing would live there ever again. The craft launched by the Terminex hurtled through space for centuries, before crashing on an unnamed planet. There the microbes multiplied until eventually becoming that which their parent race had intended: Terminus. Comments: Created by Roy and Dann Thomas, Herb Trimpe, and Mark McKenna. I'm hoping to complete the profile on Terminus in the next day or so, and that will hopefully round at the information presented here. All characters in this profile are mentioned and pictured in Terminus' entry in the All-New OHotMU Update#3. TERMINUS - the original life cycle of the Termini, who developed to stage four before consuming another stage 4 to become Ulterminus/Stage 5.
other "Term" characters, groups, etc. 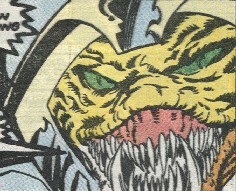 The name of the lifeform created by the Terminex. The Termini have 5 stages in their life cycle, each larger and progressively more powerful. The original Termini crashed on an unnamed planet centuries after being launched by the Terminex. There the microbes broke free, multiplied, and evolved through the stages of its life cycle until becoming the being who would be known as Terminus (apparently only a stage 4 Termini throughout the majority of its existence). After countless millennia of slaughter, Terminus met defeat on Earth. 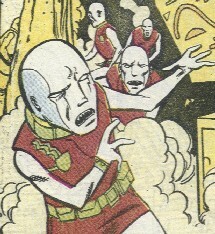 Using a combination of his own experiences, his own body structure, and Earth Deviant technology, Terminus created another batch of stage 1 Termini. To date, there have been two known life cycles of the Termini (as described above), though only one example of stage 5 being reached. The original stage 1 Termini were created by the Terminex and launched into space to escape the destruction of their world. These Termini eventually became the being known as Terminus. Terminus himself created a second batch of stage 1 Termini, which he left to gestate in a Deviant section of Subterranea. These Termini were somehow released into the magma within Mt. Saint Helens. When Vulcanologist Ramona Napier--accompanied by Captain America--explored the interior of the volcano in Tony Stark's Persephone-1, the "egg" containing the Termini shattered, releasing them into the magma. The Termini encircled the Persephone before shooting out--in the form of a glowing swarm of indistinct specs--into a nearby stream. The Termini were consumed by a number of fish, many of whom were caught by local fishermen. At a fish-fry soon after, several people--including Stark/Iron Man--consumed the fish and were driven into a violent state. Captain America fought off the townspeople and Iron Man, in the process learning that intense cold cured the people. The townspeople were saved, but it soon became clear that the fish had been eaten by other animals as well, some of whom became stage 2 Termini. This is a microbe stage. When consumed, the microbes take over the minds of their hosts, regardless of whether they are human, other mammal, reptile, bird, fish, etc., driving them into a violent and destructive state. Those that consume these hosts become hosts themselves in the same fashion. Eventually, the microbes morph their host into a stage two Termini. However, if caught early enough, the microbe infection can be destroyed by exposure to extreme cold. The first batch of stage 2's eventually evolved into Terminus. The second batch evolved from wildlife who consumed the stage 1 Termini created by Terminus in Washington state. One such bear, attacked Machine Man in Seattle, sensing the titanium he was using in an effort to rebuild Jocasta. This bear disabled Machine Man, but the robot's friend, Peter Spaulding managed to help Machine Man escape--with Jocasta's head--before being seemingly slain by the stage 2 Termini bear. 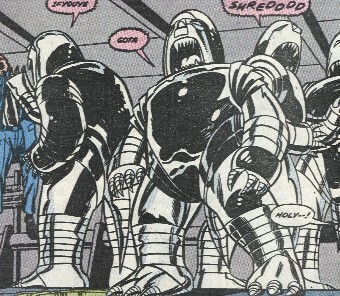 Machine Man ended up in the hands of Sunset Bain (Madame Menace), but the Termini bear followed him there, fighting Bain's guards, Iron Man, and Machine Man before finally being destroyed by a vat of molten metal. However, virtual plagues of stage 2 Termini--birds, fish, insects, and other animals--continued to attack people in the area. 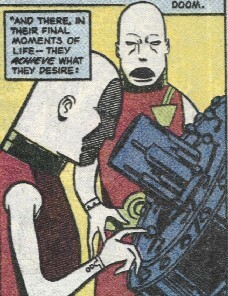 Iron Man and Machine Man, having learned of the weakness to great heat, were able to more easily destroy the other stage 2 Termini they encountered, though not without a long and arduous search and struggle. A group of the stage 2 Termini invaded the Blackrock Nuclear Power Plant, slaughtering any who barred their paths, until they managed to tear open a vat of radioactive fuel. Consuming this vat, each of the eight or so stage 2s then evolved into stage 3s. The stage 2's have the form and abilities of their host animals, but they are composed of metal and are thus much more durable. They grow in size by consuming titanium--whether by eating sold material or by absorbing the liquid metal. They can be destroyed by great heat, such as molten metal. By consuming radioactive materials, they evolve into stage 3s. The first batch of stage 3's eventually evolved into Terminus. The second batch evolved from a group of stage 2 who consumed radioactive fuel at the Blackrock Nuclear Power Plant. The Avenger Hercules was nearby and arrived to combat the Termini. However, he slipped on some of the fuel and was briefly stunned during the fight. In the meantime, the Termini turned on each other, absorbing each Termini as it was defeated, growing larger and larger until transforming into a single stage 4. (Nova IV#20 (fb) ) - At some point the New Warriors (Firestar, Marvel Boy/Vance Astrovik, Namorita, Night Thrasher/Dwayne Taylor, Nova/Richard Rider, Speedball) fought stage 3 Termini and defeated them. The stage 3's start out at ten feet tall and may possess Class 25-50 strength, durability, etc. They possess a group mind and will mimic phrases they hear, often breaking them up into a pair of syllables said by each Termini. Eventually they merge with each other to form a single stage 4. The first stage 4 was the being known as Terminus for the vast majority of his life. The stage 3 Termini merged together at the Blackrock Nuclear Power Plant, producing a single stage 4. At the same time, Terminus himself returned to Earth and fought the other stage 4--which was also referred to as the Spawn of Terminus, the son of Terminus, the false Terminus, the Termini-creature, a Stage-Four Terminoid. 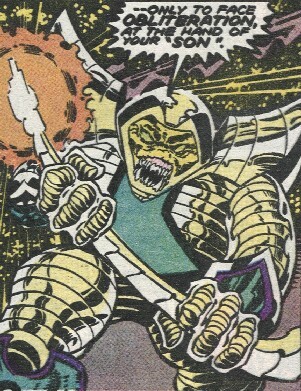 Despite the efforts of the Avengers West Coast and Machine Man to separate them, the original Terminus eventually overpowered his spawn, shrinking him down in size, swallowing him whole, and morphing into the first Stage 5 Termini. The stage 4 Termini are 150' tall and possess Class 100 strength and durability, as well as the ability to manipulate energy to some degree. The second stage 4 broke off its own spiked tail to use as a weapon. Two Stage Fours are required to create a single Stage Five, which is formed when one of them defeats and consumes the other. note: Terminus' chronology under his own profile. Also known as Ulterminus, the Ultimate Terminus, Terminoid, Terminex, and Terminator, this being was formed when Terminus defeated and consumed the form and power of the other Stage 4. The purpose of the Stage 5 was to avenge its parent race by annihilating any people or planet which had been spared by the Celestials. It headed to the center of the United States, from which it planned to drain all life from the planet. 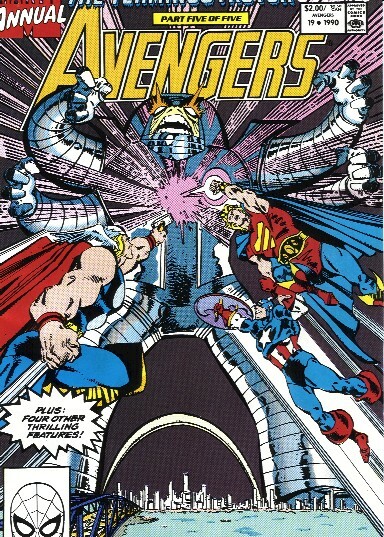 It was combated by the Avengers--East Coast, West Coast, and even Great Lakes--and Machine Man, to little avail. However, as Terminus had previous absorbed Mjolnir, the hammer of Thor, the Asgardian managed to speak enchanted runes that restored Odin's spells and full force and allowed Thor to summon Mjolnir--and Ulterminus with it--deep into space, where Thor had been trapped. When a group of Avengers, having been pulled into space along with Ulterminus, managed to pry the staff from his hands, Ulterminus was left stranded in space. In addition, as Ulterminus continued to rapidly expend energy, he consumed his own resources, eventually imploding into a black hole-like phenomenon, which then disappeared as well. Terminus has since appeared, it it remains to be determined whether it is the stage 5 version, having returned to his original appearance, or some other explanation. The Stage 5 starts out at 300 feet and can consume numerous forms of matter and energy to increase his own size and power. It possesses Class 100--if not incalculable--strength and durability, and is virtually indestructible. Like the stage 4, it relies on its staff to discharge energy blasts, or for propulsion. Its power is such that it requires a continual influx of power from other sources, or it will eventually consume its own reserves.